Valverde gets prison book at 2010 Vuelta route presentation. Valverde gets Life In Prison at Vuelta. While the other famous riders attending the presentation of the 2010 Vuelta a Espana received lavish photos books of this years’ race, Alejandro Valverde of Caisse d’Epargne received a different coffee table selection. The plaintiff and defendant in two doping cases to be heard by the Court of Arbitration for Sport (CAS) was instead given a copy of the prison expose Inside. 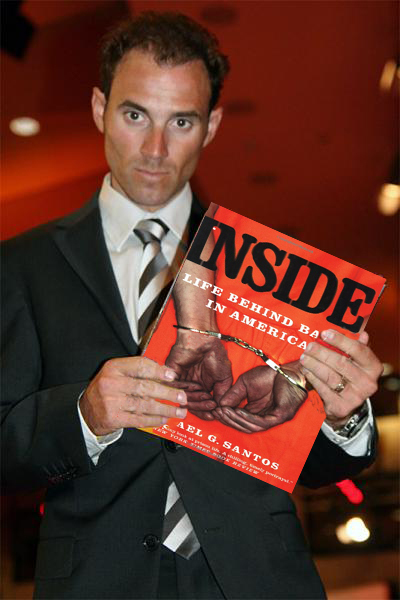 A Life Behind Bars by Michael Santos. Whether someone within the Vuelta organization switched books as a pointed doping critique or whether it was slipped in by some guest with a wicked sense of humor, nobody knows. Either way, Valverde failed to grasp the symbolism. “I tried to trade books with Contador but he preferred the cycling one. I don’t know why I would want a book about criminal behavior, lying, stealing or cheating,” said the man whose initials VALV where on seized blood bags cross referenced with “piti,” the name of his dog at the time. Valverde has been living under a dark cloud of doping allegations for over two years since the Operacion Puerto scandal broke. He is already serving a two year ban in Italy imposed by the Italian Olympic committee which claims to have a definite DNA match with blood bags taken from the infamous Dr. Eufemiano Fuentes’ stash. This has not prevented Valverde from winning over 20 major races while awaiting a decision on the doping allegations. Cycling fans around the world are puzzled about why Valverde is still riding when other riders like Jan Ullrich were driven into retirement, Ivan Basso suspended for two years and riders such as Jorge Jaksche and Oscar Sevilla black-balled. The Spanish Cycling Federation has given Valverde a big nationalist hug and refused to push the case. Operacion Puerto is now mothballed and the CAS continues to postpone the UCI and WADA cases against Valverde. Aparently nobody likes reading — especially legal documents and long, scientific papers on dope testing protocols. For his part, Valverde is looking ahead to winning the Vuelta again. One black eye deserves another. He left the book at the event and has no intention of picking it up. Perhaps he is saving it for his suspension reading time. « Rabobank spy infiltrates Cervelo training camp in Canary Islands.